During my final semester at IGIDR I did a project paper in macroeconomics involving timeseries econometrics. The concept that I focused on my study was unit root, which I have touched upon in my earlier posts. This study presents a novel applicative aspect of unit root test called persistence. We investigate the level of persistence exhibited by the inflation rate series in India and also see how this level has changed over time. historical mean path. Opposite is case of a series with low level of persistence, post a shock to the series it has a tendency to get back to its historical mean path. Inflation is measured as percentage rise in the price index or, informally speaking, a general rise in the prices of all goods and services in the economy. Its important to note that rise in prices of just few commodities could be due to market conditions in that particular sector and might not cause a general rise in the price index. For a non-econ student, inflation could be thought of as the rate at which wealth is losing its value. If the inflation rate in your economy is 10% year on year (Y-o-Y) it means that what you can buy for 100 INR today would be worth 110 INR in the next year. There are a plenty of reasons why keeping the inflation level in check is an important proposition for any economy's policy makers but I shall not elaborate on that in this post. 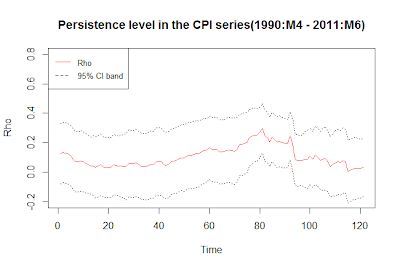 Why is measuring the level of persistence in inflation series important? Well, a simple commonsense reason that one can think of is that the level of persistence would play a monumental role in the RBI's decision of tackling inflation. If the inflation series is highly persistent then a shock to the inflation series would have to be dealt with in a much more stringent manner as the shock might tend to last for a really long time with detrimental impacts. Those familiar with macroeconomics would be able to relate this to the concept of Taylor's rule that governs most of the central bankers ideologies about weighted importance of inflation and growth. This is of course one of the many reasons why it might be important, there could be others you could think of. Let me try and explain the rolling window regression that I have used in my analysis here. Rolling window regression for a timeseries data is basically running multiple regression with different overlapping (or non-overlapping) window of values at a time. For example, if your dataset has values on a timeseries with 100 observations and you want to perform rolling regression, or for that matter any operation on a rolling window, the idea is to start with an initial window of say 40 values(1st to the 40th observation) perform the operation that you wish to and then roll the window with some values, lets say we roll the window by 5. Now, the second window of data would be the next 40 observations starting from the 5th observation (5th to the 45th observation). Similarly, the third window will be the next 40 values starting from the 10th value, and so on. The advantage of using this technique is basically to look at any changing property of a series over time. You will get an estimate of the property over time instead of one single constant measure for the entire period. 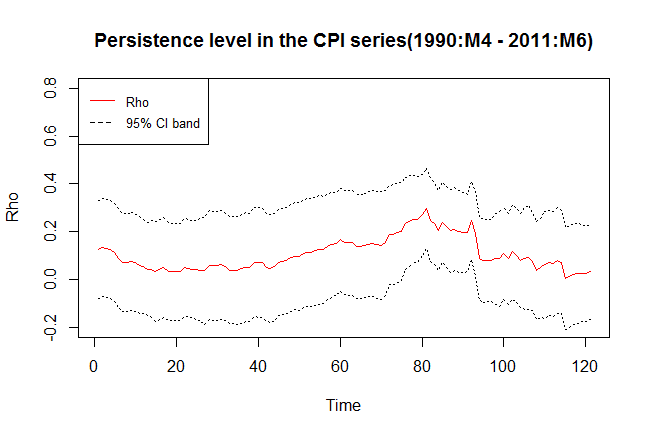 I have used this above discussed idea to look at the persistence level of the inflation series over time. 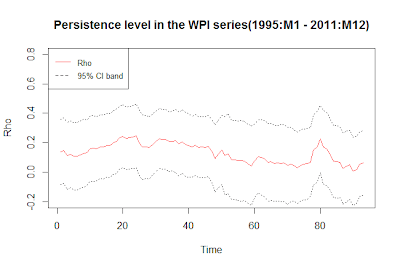 Using a rolling window ADF test regression to compute the persistence parameter and plotting it over time along with the 95% confidence band. I would confess here that the codes that I have used are not the best that one can work with. I would be grateful to reader who could suggest better way of going about this exercise otherwise I might be convinced of this "timeseries handling shortcoming" with R.
We have some interesting observations when we look at the plots. The persistence level is generally on a lower level when we look at the consumer price index(CPI) series, over time we see that the level of persistence has been constant. The story remains same for the wholesale price index(WPI) series. 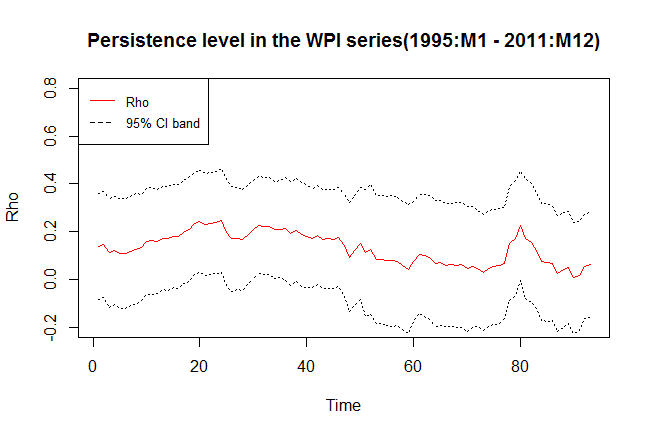 We see that the level of persistence is on the lower level where even the 95% confidence band is close to 0. There have been recent arguments about how sticky inflation rate series is for India, but the empirical investigation above does not confirm with that hypothesis. There also are arguments towards central banks faulty measure of WPI targeting. Currently, the RBI looks at the WPI series for keeping the inflation in check, but when we have a divergence in the dynamic property of the CPI and WPI inflation series it becomes difficult for the policy makers to decide to what series to target. There are research papers that throw some light on this recent divergence in the different measures of inflation in India and what importance it holds for policy makers. However, persistence seems to be a property that exhibits somewhat a similar feature across the 2 series. The results that we obtain above are consistent with this working paper at the RBI(the Indian central bank) which illustrates low persistence level across various measure of inflation. We have essentially replicated this methodology using R codes and updated data till present to affirm the argument in this paper. If you wish to replicate the exercise above the data can be obtained form here, CPI data, WPI data. The files contain 2 columns one with the raw data and the other with seasonally adjusted data. I have used the seasonally adjusted data for the analysis here. The seasonal adjustment was done using the X-12 ARIMA filter in EVIEWS. For more about seasonally adjusted and unadjusted data refer to my previous post here. The regression that I am doing is not what is really bothering me, I would like to know if I can work with the values without using the window() function. The lags() function did not give me what I wanted, so I had to manually code it using window(). But I will try and use the xts() for the timeseries plot. is there any way out to do the same analysis in SAS?